Are you working yourself to the bone? Sure, you have big dreams about the difference you want to be making in the world. But if you’re constantly stretching yourself too thin only to barely make ends meet, your business won’t have the staying power you need to continue living your passion and sharing your gifts. I see so many creative entrepreneurs get seduced by “bigger, faster, better” to the point where they’re pushing too hard, overextending themselves, and losing sight of what really matters to them. Just because you want to grow your business doesn’t mean that you need to go into overdrive. It’s not sustainable. I’ve been running my business full-time since I left my corporate job in 2006. Over the years, my company has seen ups and downs, tremendous growth and disappointing dry spells, and through it all I’ve learned how to increase my resilience and expand my capacity so I can continue to evolve on my terms. 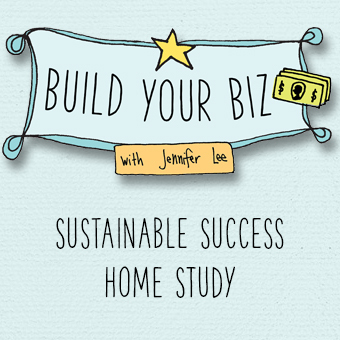 I can’t wait to share my secrets with you how in the Build Your Biz: Sustainable Success Home Study! Celebrate what’s working! When was the last time you paused to acknowledge how far you’ve come? Plus a special bonus gift! Why is the Sustainable Success Home Study module only available as part of the entire Build Your Biz suite? The Sustainable Success Home Study module points to specific teachings in the five other modules in the entire Build Your Biz suite. If you were to purchase this module on it’s own you wouldn’t get the full benefit of being able to reference the Making More Moola, Packaging Your Gifts, List Building, Launch Plans, and Team Building teachings and exercises. If you’re just starting out in your business, it’s important to be really clear about what success looks like to you and for you to let that guide you. All to often fledgling entrepreneurs get seduced by all of the “should’s” they think they should be doing and they get overwhelmed and disheartened when they compare themselves to others. Learn healthy habits early on so that you have the confidence and capacity to follow the beat of your own drum. If you’ve been in business for awhile but you’re burnt out from pushing so hard to reach your current level of success, this module is for you. You’ll learn how to honor your natural rhythms and energy while still getting sh*t done. You’ll also assess where you fall on the moola + meaning, action + ease, and leadership + support sliding scales so you can determine where to focus your energy. How is this Sustainable Success module different from your other courses? The Sustainable Success Home Study module is part of the Build Your Biz suite of modules. These Build Your Biz Home Study modules are a good fit for creatives looking to grow an existing business. You already have a sense of what your business is and who you serve but you’re struggling with making sales, you’re uncomfortable marketing yourself, you’re frustrated with your finances, you’ve been stuck in the same place for awhile or you’re burnt out from doing too much. The Sustainable Success module specifically helps you with determining what success means to you, assessing key aspects of your business to help you prioritize, and to learn how to embrace ease.